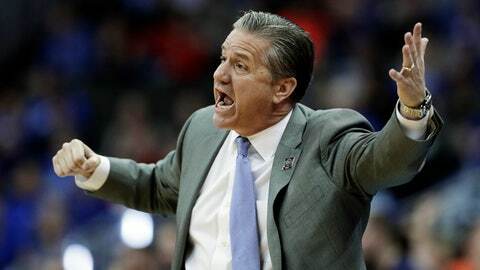 LEXINGTON, Ky. (AP) — Kentucky has agreed to a long-term contract with coach John Calipari that will allow him to finish his career with the Wildcats. Calipari’s current deal was amended in March 2017 to run through the 2023-24 season, with a base annual salary of $8 million plus incentives. Men’s basketball spokesman Eric Lindsey confirmed Monday via text to The Associated Press that the school reached a new deal with the Hall of Fame coach but did not provide details. The 60-year-old Calipari tweeted last month that his “plan and desire” was to retire at Kentucky. He is 305-71 in 10 seasons with Kentucky and won the 2012 NCAA championship in four Final Four appearances. The Wildcats, a No. 2 seed in the NCAA Tournament, lost the Midwest Region final 77-71 in overtime on Sunday to third-seeded Auburn to finish the season 30-7. Calipari’s new contract was first reported by the Athletic.